I love to ride, and I love to taste wine, so it will be no surprise one of my favorite activities is a winery ride. This was the first time I made it to the Northwest Peruvian Horse Club‘s wine ride. This year we toured five wineries in the Rattlesnake Hills AVA. We were led by Linda Spurlock of Severino Cellars and Shannon Bird, Executive Director of the Rattlesnake Hill’s Wine Trail, who were able to join us on Peruvians due to the generosity of Dennis Brown, who also did a great job of organizing the ride for the club. We met and tacked up at Severino Cellars, which is so new they are doing their tasting room out of their RV. I particularly enjoyed their Viognier. Linda also informed us about the Rattlesnake Hills Wine Trail Passport. For $10, Passport holders receive several benefits, from waived tasting fees to excellent discounts on bottles of wine. Mine was definitely worth the $10. 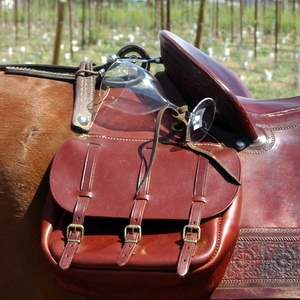 After our first tasting, we saddled up and took the short ride over to Two Mountain Winery. Here we took turns holding each others horses and going in to the tasting room. I liked their off-dry Riesling enough to pick up a couple of bottles. Then it was through the vineyards and orchards up to a large irrigation canal for the longest leg of the ride, over to Silver Lake Winery. By far the largest winery we visited (and apparently the largest consumer-owned winery in Washington), it was very busy when we arrived. Naturally we made quite a stir when we showed up and rode through the parking lot. The winery had a couple of hitching posts we were able to use, but not enough for our entire party of 17 riders. The Passport let us waive the $5 tasting fee for the cask wine list. It was quite a selection. As usual, I restricted myself to the whites.1 Their Roza Rose was such a perfect summer wine that we bought a chilled bottle to share with everybody before we got back on. I also picked up a couple of bottles of Riesling. And just how did I handle carrying all this wine I was buying? Why, I put it in the chase car, naturally! Two club members, Randy Eldridge and Pedro Cantaro, were kind enough to drive instead of ride. They arrived at each winery ahead of us, and let us put our bottles in the car. They even brought them back to the starting point and let us have them back! And it was a good thing that car was there when we got to the fourth winery, Paradisos del Sol. I was lucky enough to have a tasting lead by the winemaker, Paul Vandenberg, a man who is passionate about wine and its history. The mantra at the tasting was “sip, sip, taste, sip.” The wines were all paired with food. Only after taking the first tasting sips do you try the food, then sip again to see the difference. I’ve been taught this before, and it’s a great way to taste wine. Some wines are great alone, some truly come into their own when paired with the right food. The whites were paired with a couple of different dips. The real fun came with the dessert wines. The Angelica G was paired with a piece of pear. For the port, there was chocolate to warm in our mouths and then taste the port again. And for the Botrytis Riesling, we were asked to toast mini marshmallows over a candle. The real discovery for me was the Angelica G, the winery’s take on angelica, sacramental wine created by Franciscan friars in California. This fortified wine comes in at a hefty 19% ABV. It has a great balance of spice and sweetness, with some hints of cinnamon and cardamom to it. I’m looking forward to sharing this with friends over a delicious fruit-based dessert. Our last winery of the day was Maison de Padgett. I wish I could tell you more about their wine. I walked into the beautiful tasting room, but found out that while the Passport would get me discounts on any wine I bought, it didn’t include the tasting fee, and while I had remembered my credit card, I had no cash on me. I’m sure I could have found someone to loan me the cash, but I was a bit wine and ride fatigued, so I gave it a pass. Others who did the tasting said they had a wide range of unique wines, so some day I will definitely go back and give them a try. The Passport has no expiration date, after all, and features 15 of the Rattlesnake Hills wineries. The it was back to Severino to untack the horses and pick up up all our bottles. We were all pretty exhausted, but found the energy to enjoy some cheese, salami, and crackers as a snack before we headed to the Franklin County Saddle Club for our potluck dinner. If you are ever in Zillah, Washington, and like great wine, I highly recommend giving the wineries of the Rattlesnake AVA a taste. If you can make your tour on horseback, all the better! I am one of those cursed with red wine as a migraine trigger. also had a great time. Stevi, I am so glad you enjoyed the area and wines you tasted. The Rattlesnake Hills is really a very unique area with so many small, boutique estate wineries and they all take great pride in making their excellent, hand-crafted wines, and in being very welcoming wineries, easy to visit and taste. While I think the wines and wineries of the Rattlesnake Hills are wonderful, I have to say the excitement of the ride for me was being on a Peruvian Paso horse. Having grown up with western horses, I really looked forward to riding a gaited horse and I wasn’t disappointed. I am a convert! If ever I have the opportunity to own another horse, it will have to be a Peruvian gaited one. These horses are spectacular – gentle yet full of pride, responsive enough that I found my one-handed steering using the reins seemed to confuse the gelding I was on, and when I used two hands – the responses were so quick I had to apologize to the riders behind me for cutting across their paths. And the gait? Oh, my gosh! Smooth as silk. I did ask Dennis to sell the gelding to me but I think he’s rather attached to him, too. Of course, the Northwest Peruvian Horse Club members were a pleasure as well. Friendly, helpful, great sense of collective humor. And they like wine! There was lots of laughter on the ride with these folks. I had a wonderful time with the group, and I am looking forward to their return to the area for another ride soon! Great blog! I must clairify, however, that Severino Cellars is “new” but we also have a tasting room. 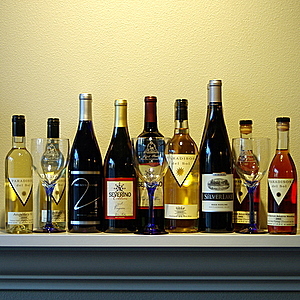 The location, for anyone other than wine trail riders, is 1717 1st Avenue in Zillah. Because the location of our tasting room is not up “north” by the other tasting rooms, but our vineyard is…we brought our wines to you! I just would not want someone to travel to the vineyard looking for our RV to taste our wines! Yikes…that would not be a good thing! But, speaking of good things! What a blast I had on Saturday! Of course, any day on a horse is good – but throw in the fact that it was on a Paruvian – total BONUS! No, I won’t be trading in my Paint for a Paruvian (’cause I LOVE HIM!) but if I ever need to replace him (God forbid) I would definately consider a gaited horse! It was my extreme pleasure to have been your “guide”. Thanks for the fabulous experience and great company! Enjoyed every minute of it! Please feel free to contact me if you ever need someone to take you back to these wineries or to visit others in our area! FYI – the headaches you are experiencing from drinking red wines is actually an alergic reactions to the tannins. Which are found extensively in the red grapes and some in the oak they are stored in. My internet research suggests (if you really like red wines but not the headaches that accompany them) is to take an antihistimine prior to consuming red wine and also a headache medicine. This is suppose to help – I don’t know if it eliminates it altogether.